The answer to that question is, of course, everything. 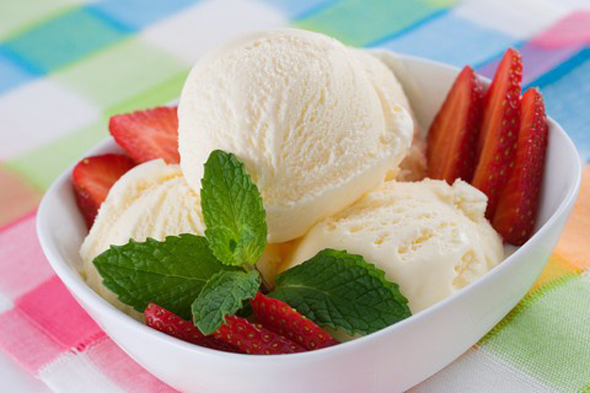 Everything goes with vanilla… ice cream. But vanilla crocheted cropped sweaters can be a bit more problematic. I bought this vanilla crocheted sweater by Vince a few weeks ago and it’s been “seasoning” in my drawer ever since. 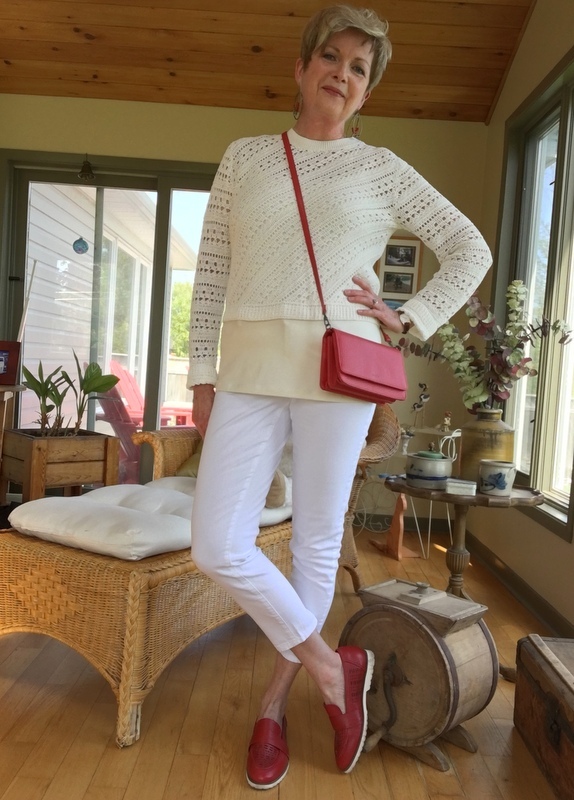 I love a crisp white or creamy sweater for summer. I have visions of this one over a loose sleeveless cotton dress, or with a creamy camisole and a pair of high-waisted pants, or over a long, loose tank ala Eileen Fisher with cropped jeans and sandals. My grandmother taught me to crochet squares very similar to this pattern. But in the meantime, I’m trying it with what I already have in my closet. Try #1. I have a creamy vanilla camisole, below, which is the perfect colour, but not as loose as I’d like around the middle. I love the cream sweater and cami with white jeans. These are my old favourite Hudson jeans. But they’re a bit too lumpy and rumply in the abdominal area. The cami is quite snug and shows every ripple. Ha. Wish I could say that there were only ripples under there, my friends. Try #1. Okay for colour, bit too snug around the middle age middle. Try #2. Better. These are my NYDJ white, cropped jeans from 2015, below. They fit more smoothly around the middle and look better under that stretchy cami. It’s too cool yet for sandals, so I’m wearing my soon to be ubiquitous, red Earth brand loafers, my new red cross-body bag, and a pair of old red and gold hoop earrings. I’ll wear this outfit with sandals later in the season. For now it’s good enough to wear shopping for something else to wear under the sweater. Try #3. I swapped the cream camisole for a black one, crepe joggers which I bought at Aritzia in 2015, and my black, suede Paul Green flats from last year. The joggers have lovely flat pleats in the front which help hide middle age middle. And the cami has a band of extra stretchy fabric in the stomach area which smooths out all the ripples. The bottom four inches or so of the cami is loose and looks good peeking out from under sweaters and such. It’s called a “Yummie Tummie.” I know. Dreadful name. I bought it at a store here in Ottawa owned by a former student, and when she called into the dressing room, “Ms Burpee, try this Yummie Tummie under that top,” I barked back: “I am NOT wearing anything called Yummie Tummie.” Ha. Turns out I loved it. Try #3. I like this look okay. I like this outfit. I love black and cream or black and white. I’d probably wear this with my structured black and white Kate Spade bag for a lunching lady look. I tried the sweater and cream cami with my striped A.L.C. midi-skirt. 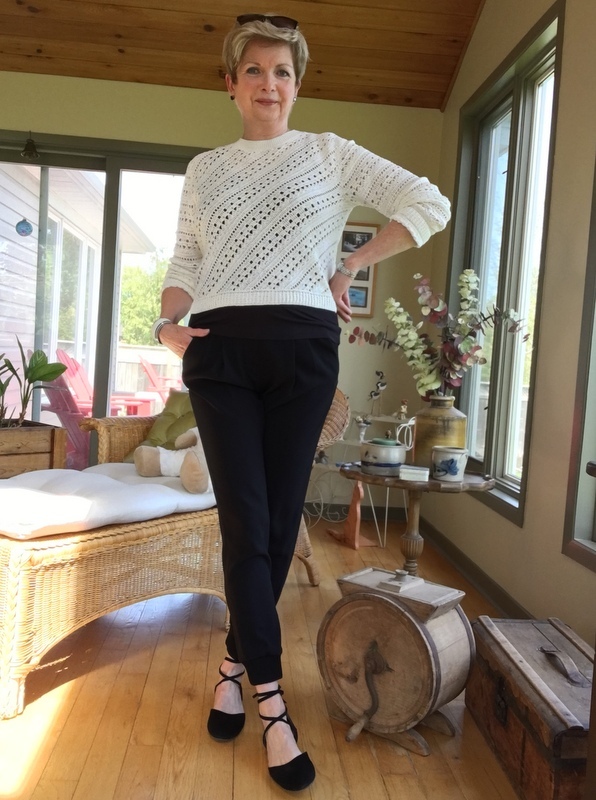 I tried it with my pink Elie Tahari cropped pants. I tried it with my black, cropped Rag and Bone pants. I didn’t like it with any of them. That’s okay. I’ve lots of tops to go with those bottoms. And this week, I’m going shopping to find something else to wear with my vanilla crocheted sweater. I’m using these shots from Pinterest to inspire me. Shots from Pinterest to give me ideas. I have a gift certificate from Escape, a lovely shop in downtown Ottawa. I won the gift certificate at a lunch/fashion show a couple of weeks ago. Maybe I’ll find a summery dress or a long loose tank to wear with my sweater. Or even a pair of summery khaki or tan pants? Who knows, I may just get lucky. This store is totally new to me. I’ll let you know how it goes. Meanwhile, I may not be the picture of cutting edge fashion in this outfit. But I am definitely the picture of contentment. With my clothes. With myself… at least this week. Ha. And certainly with the spring sunshine. Spring sunshine feels so very good. All this talk of vanilla has made me hungry for ice cream. Maybe for dessert tonight with some strawberries and a shot of chocolate sauce? Vanilla ice cream goes with everything. It’s so easy. Unlike a vanilla sweater, where I not only have to worry about the colour and shape of the vanilla scoop, but also the size and shape of the bowl. And if I don’t lay off the chocolate sauce, not to mention the ice cream, the bowl will only get bigger and bigger. Ha. Okay, that’s definitely stretching the metaphor too far. Now, I have to wrap this up, Hubby and I are off to visit our 95 year old former next door neighbour. She lives in a seniors apartment complex in the village, and has invited us over this afternoon for a glass of wine. Now it’s your turn my friends. What’s new in your wardrobe? Linking up this week with: Visible Monday, #IwillwearwhatIlike, Thursday Favourite Things. It's a pretty top Sue, and who doesn't love vanilla?! I love all the lights and whites together pops of red. But know what you mean, I have a few long camis and they show up my zips and buttons, so the idea of your Yummie Mummie oops, Tummie, sounds like a real winner. New with me? I'm trying to stock up on a few short sleeved Ts and some chinos – it's a work in progress. Hugs, x.
I’m liking the black best too & it shows off the cut out pattern on the jumper . I’d look grim in that jumper though . The ‘ Twiggy ‘ figure I used to have has blossomed too much I’m afraid & top heavy figures can’t do short , pale jumpers with high necks . You don’t have that problem . Yummy tummy tops sound interesting – do they do yummy bummys too ? I’ve branched out this week & bought some new soft trousers in a fine grey stripe by a company called Two Danes ( not expensive , so worth a little experiment ). Weird on the hanger , sort of wide legs going in at the bottom but I rolled them up abit & I like them , I think . Wish Max would stop calling them my clown trousers . Ha… my lower Twiggy is still intact and at war with my upper non-Twiggy parts. I'm questioning the wisdom of buying that sweater, now. 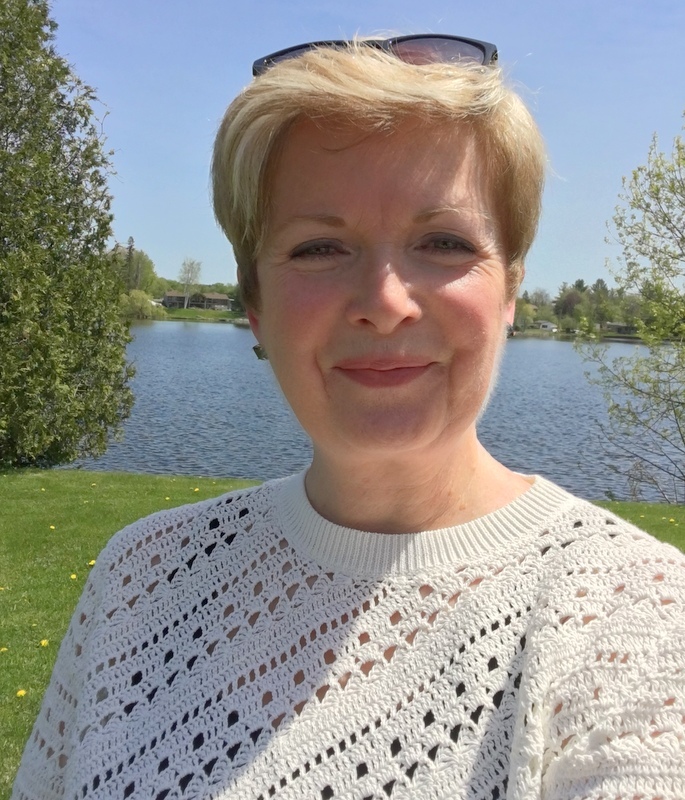 Wondering if I was lulled into a false sense of my security by the fact t hat I always used to wear cream cotton knit sweaters, I may have been looking at my past self in the mirror! Those pants sound interesting. I've never heard of Two Danes. I'm hoping that I will have good luck at that new store. Or maybe in the Eileen Fisher section of Nordstrom. I usually avoid EF because of the neckline, but if I'm wearing the sweater over the tank or dress the scooped neckline shouldn't matter. Fingers are crossed. That name got up my nose partly because it reminded me of the term "yummy mummie" … which I think is offensive to women. Ickk. Imagine thinking that it's okay to call women "yummy" in this day and age? Oh… they are there. Ha. i really like your new jumper but i noticed the pinterest pics you have are all loose top layers and your new top is reasonably fitted. this might be whats causing your lack of enthuisiasm? it looks really pretty with the black though. Maybe. The sweater was styled at the store with a long silky tank like in the photos, but it didn't fit me properly and it was very expensive. So I'll keep looking for something similar but a bit more simple like the Eileen Fisher ones. Thanks, Amelia. Style and fashion are indeed a vast wilderness…and sometimes we take wrong turns when we're in uncharted territory. I definitely like vanilla in all its forms 🙂 Especially as clotted cream on top of ice cream!! 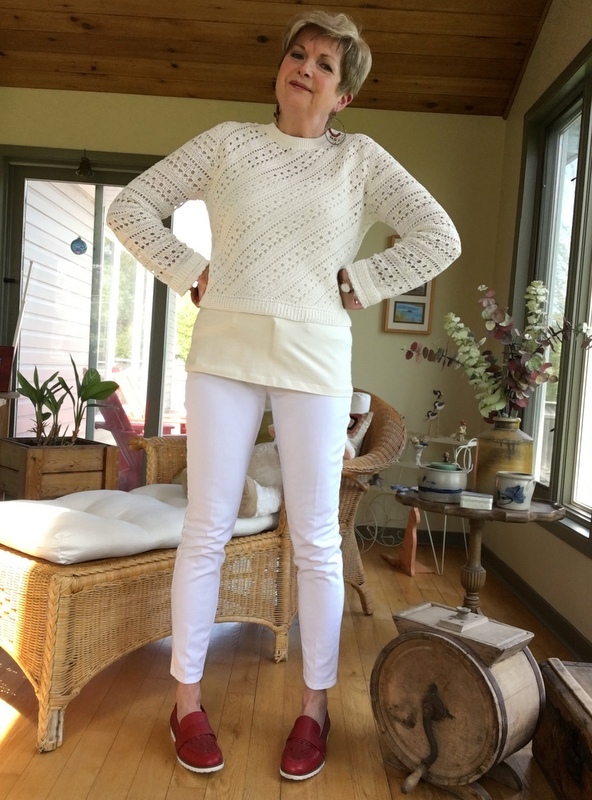 Gorgeous new sweater Sue … I like how you’re styling it with trousers. Hoping you may show us it over a dress as well. 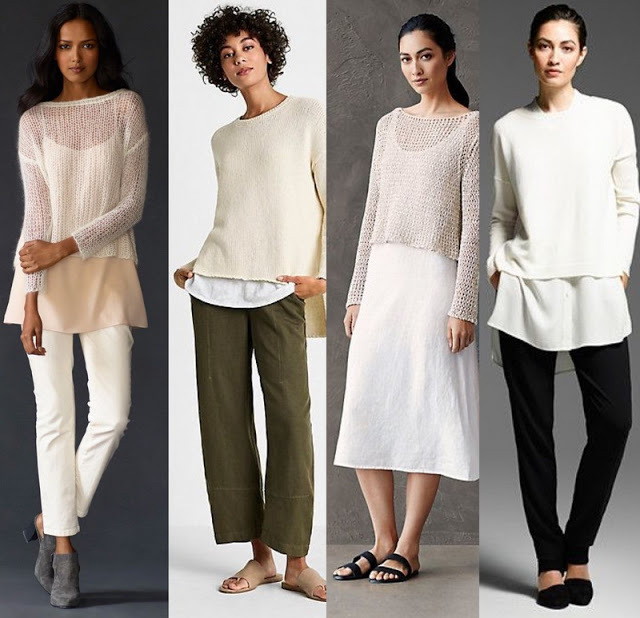 I tried this look a year or so ago but guess I didn’t find quite the right sweater… I’ve got a shorter boxy cotton one and a longer cotton lacy one( light cream and ecru) but somehow it’s a case of what works in my head, doesn’t work as well on my body, … again !! 🙂 They tend to make me look chunky! New in my wardrobe? … I’ve decided to introduce some yellow … a deep and golden shade, rather than “lemon” I’ve bought some espadrilles ( I’ve the same ones in other colours, they’re so comfy) a cute, cotton pouch/clutch and a linen tunic style dress in pale grey/ yellow/white … it has lemons in the print! Not 100% sure that I’ll keep the dress though, as although it will be lovely for holidays, I can’t see me popping it on to walk to town or any of my usual day to day activities … I’m usually much more conservative.. very few prints in my wardrobe, except for scarves. I’ll try and put them on IG so you can see them … that’ll be a first for me! You should do that, Rosie. II'd love to see a shot of that dress. The reason I liked my sweater is that it's not too boxy, and yet not fitted at the bottom. I'm off tomorrow to see if I can find the perfect tank (or dress) for underneath. Sometimes my problem is that I have a very specific idea of what I want, and come home with nothing. I may add some more yellow to this season. My old yellow sweater made me realize how much I love yellow. I seem to recall a comment you made about leather pants and a cream or white sweater… started me thinking of white sweaters for summer. Mine is certainly a work in progress. If only I could wear wide-leg pants. My diet has gone well except for the middle. What us with that tummy chubbiness I can hold in 2 hands still. Oh well. I love your red pops look. Cream on white is very Scandinavian as Mary said in her blond on blond post last year. I think you look elegant in the black look. Don't knock it. I like it a lot.